Jay Bothroyd's 90th-minute winner took Charlton into the FA Cup fifth round after a gutsy display from League Two side Leyton Orient. The Premiership side took the lead after six minutes, Jonathan Fortune finishing well with a diving header. Joe Keith hit the bar for Orient just before the break, but Lee Steele equalised as his toe-poke squirmed under Charlton keeper Thomas Myhre. And Bothroyd's deflected late free-kick allowed Charlton to squeeze through. The Addicks' feeble Cup record meant their fans were far from confident of overcoming the side who knocked out Fulham in the third round, but Fortune's early goal settled their nerves. Ambrose's lovely delivery allowed Fortune to steal in between two defenders and power his header past Glyn Garner. Orient's 6,000 travelling fans had little to cheer early on, with Shane Tudor's strike over the crossbar their best attempt in the opening minutes. Charlton should have doubled their lead on 16 minutes, when another excellent Ambrose cross found Shaun Bartlett unmarked, but the South African's glancing header went just wide of the post. The hosts looked well in control, but shortly before the break Orient showed what they were capable of, creating four good chances in quick succession. The best fell to Keith after Steele's great cutback, but the midfielder's volley hit the crossbar and Charlton were grateful to hear the half-time whistle soon after. It was Orient who kept their momentum going early in the second half, with a series of hopeful crosses causing panic in the Charlton defence. Julian McMahon and Keith played Steele in behind Luke Young, but the midfielder's on-target effort should have been saved comfortably. Myhre failed to get his body behind the ball at the near post and could only watch it roll over the line. The goal saw Charlton raise their tempo significantly, and a triple substitution gave them added impetus. Jerome Thomas went close, and striker Darren Bent was unfortunate not to have been awarded a penalty after being knocked over by Garbriel Zakuani in the area. Orient went close through McMahon's header on 77 minutes, but it was Charlton who were pressing the hardest. Ambrose's effort was cleared off the line by Michael Simpson, and with the game almost over Bothroyd's deflected free-kick beat Garner. "We take the FA Cup very seriously but we just haven't done well enough over the years - we're happy to get through. "It seemed like we thought we'd done enough by scoring early on, and Orient deserved their equaliser. "But it was a great Cup tie, with the last 20 minutes really end-to-end." "It's heartbreaking - we gave everything we've got and then lose out in the last few seconds to a deflected free-kick. "We've matched Fulham and Charlton in terms of passing the ball and creating chances and that's very pleasing. "We had chances to win it, so we're frustrated to say the least." Charlton: Myhre, Young, Fortune, Hreidarsson, Powell, Ambrose, Kishishev (Thomas 63), Holland, Hughes (Smertin 63), Darren Bent, Bartlett (Bothroyd 63). Goals: Fortune 7, Bothroyd 90. 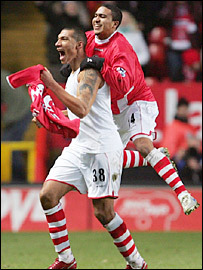 Leyton Orient: Garner, Miller, Mackie, Zakuani, Lockwood, Tudor, Simpson, McMahon, Keith, Alexander, Steele (Duncan 85). Subs Not Used: Morris, Barnard, Saah, Demetriou.